Saki Naisau went from losing in last year's final as a Dragon to being victorious with Canes this year. 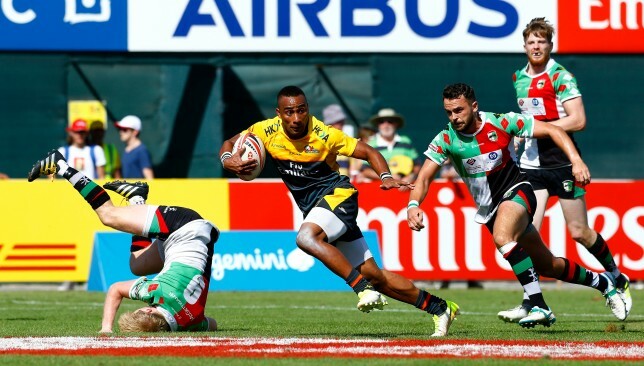 As one of their star players was only too happy to point out, Dubai Hurricanes flew into the Dubai Sevens under the radar – the issue now is everyone will know what they’re about. It’s wonderful to see another name engraved onto a winners’ trophy in domestic rugby – different victors have been few and far between in recent years. Up until April, UAE rugby had been dominated by Abu Dhabi Harlequins and Dubai Exiles over the last four years. The pair had won 14 of expatriate rugby’s 18 trophies since the 2014/15 season. Jebel Ali Dragons joined the party at the start of 2018 when they hoisted a long overdue piece of silverware – their epic West Asia Premiership victory was a first trophy in four years. It had been even longer for Bahrain – exiled on the fringes of west Asia – whose West Asia Cup triumph earned them a maiden success after eight barren years. Last year’s Premiership hinted at an exciting new era of fierce competition ahead. Quins, Exiles, Dragons and Bahrain all went toe-to-toe with one another. 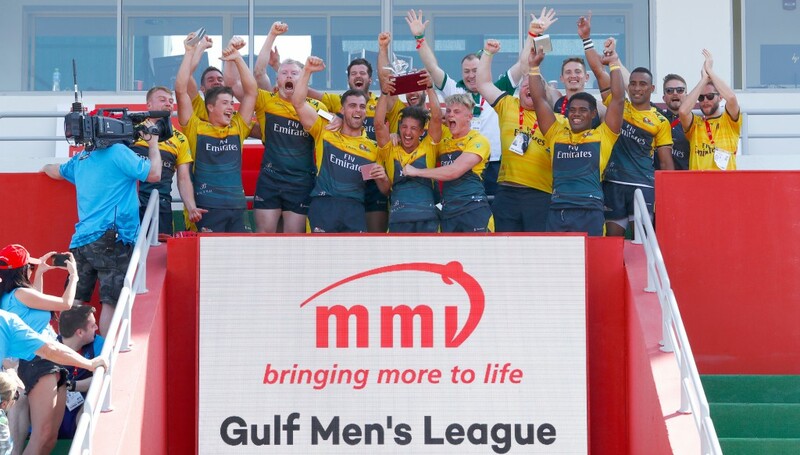 In the end Exiles claimed the Dubai Sevens and UAE Premiership double, Dragons won the West Asia Premiership – rugby’s most coveted title – and Bahrain had the West Asia Cup. Dubai Hurricanes won at the Dubai Sevens for the first time in 11 years. Hurricanes? Who are they? They were nowhere to be seen – just good enough to avoid a relegation scrap between Abu Dhabi Saracens and fledgling Dubai Eagles but nowhere near the standard being set by the foursome at the forefront of the domestic game. But ex-Wales sevens international Matthew Pewtner’s arrival hinted at a shift in a more professional direction – as had the link-up a few years previously with namesake Super Rugby side the Hurricanes, from whom Canes acquired Sam Tufuga and Gerard Faitotoa last October. Pewtner came in around the same time as backs coach, ambitiously stating he one day hoped to get Canes playing on Pitch 1 in the main Sevens Stadium, where the Gulf Men’s League final is always staged. Pewtner played with Wales all around the world, but missed out on Dubai twice through injury, so it was ironic he should appear there for the first time as a coach. Excellent work has also been done by Mike Wernham at Canes. The Englishman is a schoolteacher by profession, which has no doubt helped drill his side into shape during his 22 months in charge. Treble winners in gulf rugby as recently as 2010/11, Canes have certainly taken a tumble since then. When the 15s season returns, Bahrain and Quins will remain the two teams to beat in the West Asia Premiership. But while 2018/19 may be a bit soon for Hurricanes to change the forecast on that front, a storm is definitely brewing. 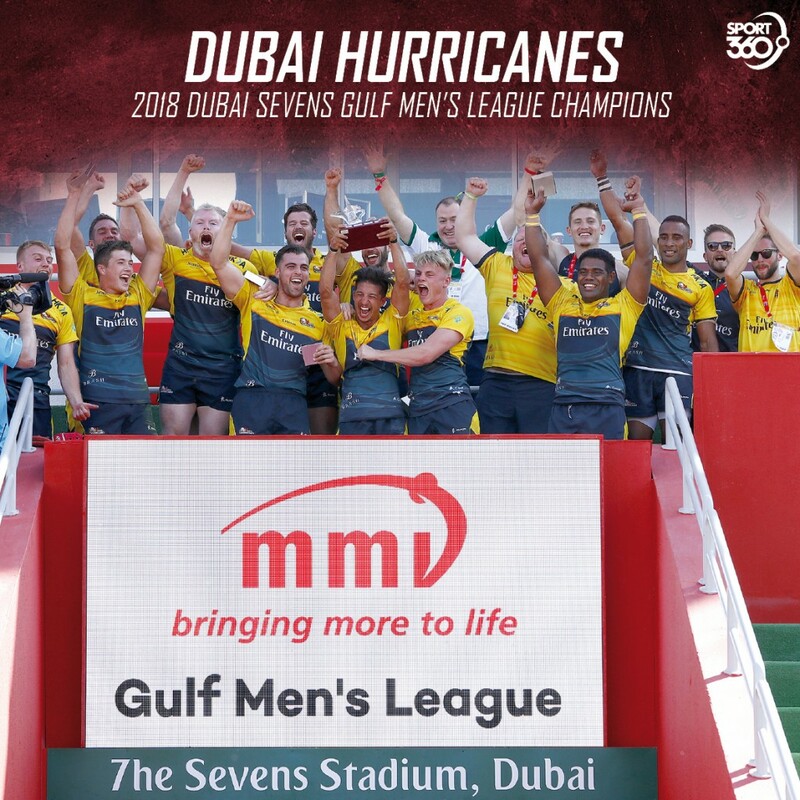 Dubai Hurricanes players used the fact they had been “completely written off” before the weekend as motivation to storm to a maiden Dubai Rugby Sevens title in more than 10 years. Canes beat serial Sevens winners Abu Dhabi Harlequins 24-14 in Saturday’s Gulf Men’s League final to end a barren run at the tournament stretching back 11 years. So long ago was their last triumph, the venue for Saturday’s final – their home ground of The Sevens Stadium – hadn’t even been built yet. That 2007 victory – their first Dubai Sevens title – had come the final year the tournament was held at the old home of rivals and city neighbours Exiles’ Al Awir ground. Tries from ex-Jebel Ali Dragons centre Saik Naisau, Joe Riley, Lewis Anderson and Boris Finck – plus two Finck conversions – proved enough to send Canes to victory against Mike McFarlane’s Quins on Pitch 1, inside the main stadium. Saki Naisau went from losing in last year’s final as a Dragon to being victorious with Canes this year. And Finck revealed that negative press – or in Canes’ case, no press at all – played a small part in their triumph. “There was an article written heading into the Sevens about every other team bar us,” said Canes’ French fly-half Finck. “We were completely written off and that worked in our favour because no-one expected us to come out firing the way we did. Canes surged through their Pool A schedule with three straight wins – including against West Asia Premiership leaders Bahrain and rivals Exiles, the reigning champions. They swept aside Abu Dhabi Saracens in the quarter-finals before a pair of nervy last-four showdowns. Quins edged Bahrain 12-10 while Canes overcame last year’s finalists Dragons 21-19. Canes have been steadily building under the tutelage of Mike Wernham and ex-Wales sevens international Matthew Pewtner. The former Dragons man came on board as backs coach a year ago with a keen eye on developing the club into a sevens force. Canes have spent the few years stuck in obscurity since reaching the UAE Premiership final four years ago and being soundly beaten by Quins. Since then, they’ve bizarrely found themselves sandwiched in between the top and bottom teams in both the UAE and West Asia Premierships – too good to be relegated but not good enough to battle Quins, Exiles, Dragons and Exiles for major honours. But there has been something stirring this season, with reigning West Asia champions Dragons toppled as Canes sit third in the league, behind Quins and Bahrain. “The progress we’ve made as a team throughout the season has been class,” added Finck, who heaped praise on coaching duo Wernham and Pewtner. “The systems in place, the coaching set-up, a lot more professional. Everyone’s buying into it. Did I think we could win the tournament beforehand? Yeah. As soon as the team sheet came out you could tell the skill and pedigree of players we had, it was unreal. New Zealand’s dominance of the 2018 Dubai Rugby Sevens was completed on Saturday night when their depleted men’s side defeated first-time finalists the United States 21-5, a day after their female counterparts had downed another North American opponent in Canada. Scott Curry, Sam Dickson, Akuila Rokolisoa and Regan Ware were among those unavailable for the All Blacks Sevens on Saturday, meaning they had just nine players for the showpiece in front of a packed crowd at The Sevens. “We missed a few soldiers,” said Andrew Knewstubb, who was named player of the final. A 7-0 half-time lead was earned for New Zealand by Tone Ng Shiu’s score. Luke Masirewa’s early sin binning after the break for a high tackle was soon punished by Stephen Tomasin’s darting run from the left for the USA. This score to make it 7-5 came with only four minutes left. But this was as close as the States would get. Dylan Collier, just about, evaded the rapid Carlin Isles to run in and Ngarohi McGarvey crossed at the death to crown the win for New Zealand. This was New Zealand’s record-breaking seventh Dubai win and first since 2009. England earlier took bronze by edging Australia 15-14 in a thriller. 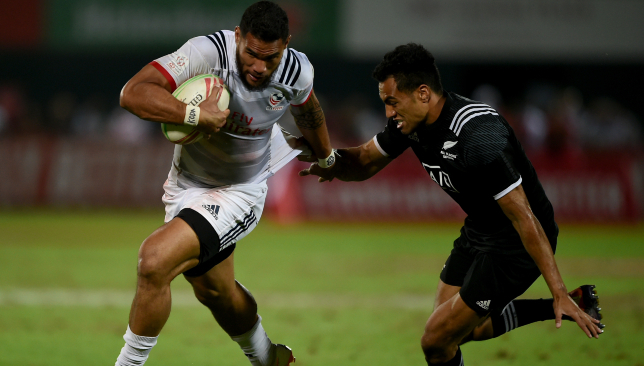 Fiji won the fifth-place final, beating reigning Dubai champions South Africa 24-19 in an extra-time clash with two tries from debutant Aminiasi Tuimaba. Samoa claimed the first silverware of the 2018/19 World Rugby Sevens Series by beating beat France 33-24 in the Challenge Trophy final. Meanwhile, the Black Ferns continued their perfect start to the campaign with a 26-14 victory against Canada in the Dubai Rugby Sevens final. The 2017/18 World Rugby Women’s Sevens Series runners-up saw playmaker Tyla Nathan-Wong play the starring role on Friday night, scoring a brace of tries and notching three conversions against opposition who were also undefeated at The Sevens Stadium coming into the decider. This triumph followed on from last month’s opening success at Glendale, United States. “Dubai is one of my favourite places to play,” captain and Player of the Tournament Sarah Goss told Newshub.co.nz. Theresa Fitzpatrick began the scoring in the third minute, but Canada hit back immediately through Ghislaine Landry’s converted try that put the North Americans into the lead. The stage was then set for Nathan-Wong, who split the defence right on half-time to earn her side a 12-7 lead at the break. Julia Greenshields’ sprint home from distance. This closed the gap to five points. Bianca Farella saw her, critically, sent to the sin-bin. In her absence, Fitzpatrick sold a superb dummy before releasing Nathan-Wong to cross over unimpeded for her second try. Sydney is the next stop on the women’s tour, in February.